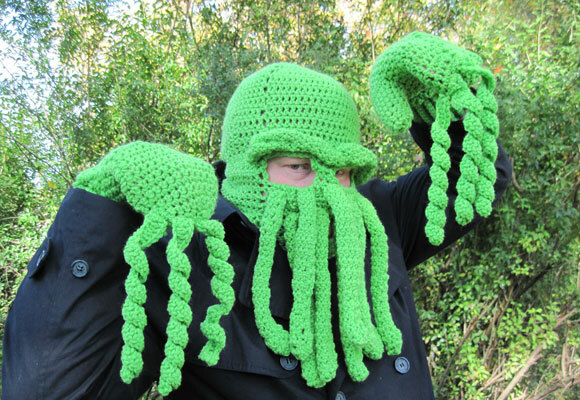 My hubby spotted this crocheted Cthulhu ski mask online and wondered if I could make it for him. I tried to see if there were directions for this mask (there weren’t) and instead found another online that was similar but not the same. I made it, and didn’t like it. I tossed it. I decided to just make a ski mask where I could make up the pattern for the tentacles myself. Problem was, I couldn’t find a ski mask pattern I liked either! My hubby wanted eye holes, rather than an open bar across the eyes, and so I eventually just created a pattern myself to give me a base. After I made the ski mask, I then crocheted the tubes for the tentacles and eyebrow. It took a couple hours to sew it all in place if you can believe it! But I was happy with it all when it was done. Problem was, when he tried it on I knew he needed something else to really set the costume off. I decided to make these Cthulhu mittens. I took a regular crocheted mitten pattern and then added curly tentacles to the end. I loved this effect and think it adds just a little bit extra to the costume. What do you think? Yeah, he says he’s going to wear this plowing snow. Thanks, Cyndi! He does think that, he was so happy about it I was glad it turned out the way he wanted. This is hysterical… and absolutely wonderful! I hope he appreciates all the work and talent that went into it! Thanks! He does know how much work went into it. He kept saying, “thank you so much for doing this” while I was crocheted at night for weeks making it. Then the pattern wouldn’t turn out, and I would rip it apart and start over and he’d say, “I really appreciate this.” LOL! I’m lucky, he knows what goes in to this kind of stuff. omg this is insane. i cannot wait to try to make one!!! 😀 you are fantastic! Isn’t it cool how you can get so imaginative with crochet? I hope your husband appreciated it and had fun. He did, Tammy! It was a blast. This is awsome. My son wants me to make him one. Is there a patterrn for this and if so where can i find it? I just sort of made it up, April. LOL So no pattern.